A three could fit in this square, but so could a rabbit. And a six has to go here. No, make that a butterfly. Oh, silly Toondoku! If you haven't figured out by now, Toondoku is Sudoku with pictures. Actually, if you couldn't figure that out from the title of the game, this Sudoku game might be at your level of difficulty. For those living under a rock, Sudoku is a popular puzzle game that's usually played on paper. It usually consists of a 9x9 grid partially filled with numbers, and the object is to fill out the rest of the grid with numbers so that each row and column only has the numbers from 1-9 and each smaller 3x3 box in the grid also only has the numbers from 1-9. Although I think of Toondoku as "my first Sudoku," I find that filling out boxes based on pictures is more confusing than filling out boxes based on numbers. This game would be most suited for younger players who can't read numbers, but don't they teach that in kindergarten anyway? I hope this isn't the type of thing to enforce the "numbers are scary" way of thinking in young children. 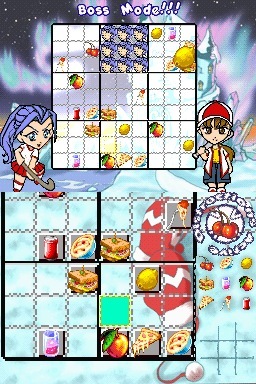 Toondoku boasts three multiplayer modes, including single-card play, as well as a Distraction System. The Distraction System reminds me a little of Wario Ware for the GameCube where it was possible to block your opponent's screen with images to annoy them. There's also an Edit Mode that lets players create and make their own images to use in the game. For the more anti-social player, there are three single player modes that are pretty self explanatory: Stage (story mode), Instant Play, and Vs. CPU. The most important feature for any Sudoku player is the ability to write notes about particular tiles. Toondoku recognizes this and includes the ability to make up to nine notes on each square. The game looks to have a decent amount of replayability even when looking at just single player features. Players can choose from four playable characters in the beginning and unlock five more through Stage play. In addition to graphics editing mode, there's also a puzzle creation mode. Toondoku may not break any new ground when it comes to a Sudoku game, but the cartoon graphics and lack of numbers may be a good way to start little Betsy or Bobby on the latest puzzle craze.